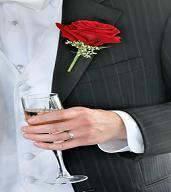 Free best man toasts - your avenue to performing your best man duties effortlessly. One of your best man duties will be to propose bestman wedding toasts to the bridesmaid and the parents of the bride and groom. Effective best man toasts must be well prepared and definitive. Be mindful of rambling on with no purpose. So, prepare thoroughly and end off on a high note! You may want to use the free best man speeches together with the toasts below for a complete package - written in verse [a great way to get away with reading your speech]? I think I'll just keep going. Such stunning bridesmaids are not easily found! To [insert name of bridesmaids]! wait for the guests to respond to the toast and then lead the clapping to acknowledge the bridesmaids. Best man toasts should also include a toast to the parents. Keep it short and sweet. The guests need to celebrate the bride and groom's wedding day - not listen to unduly long speeches.